Since your tires contact the road, it directly affects your handling, ride, braking and safety. It is important to check your car’s tires monthly to make sure you and your family are safe. Having properly inflated tires maintains good gas mileage and extends the life of your tires. Tire pressure should be regularly checked because tires naturally lose air over time. Your vehicle’s owner’s manual will list what the vehicle’s tire pressure should be. 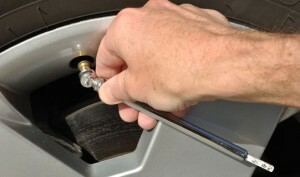 Use a pressure gauge to check tire pressure, which is measured in pounds per square inch (psi). The three different types of tire gauges are digital, dial and pen/stick. The treads are the part of the tire that contact the road. Good treads provide good grip and traction between the car and the road. The tread wears down the more a car is driven. The more the tread is worn, the flatter and smoother the tires become. This means that if it is snowing outside and the tread on your car are worn, the car would slide and not be easy to control. 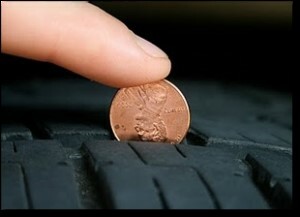 To test and see if the treads on your car are good, take a penny and place it in the grooves of the tire. If the tire does not cover Lincoln’s head, then your car has less than 2/32″ of tread, which is below the legal minimum. A tire rotation is where the tires that are in the front of the car are swapped with the ones in the rear. Tire rotations helps maintain even wear on the treads. Also, it helps improve gas mileage, provide a smoother ride, and prolongs your vehicle’s suspension components by reducing vibrations. It is recommended that the tires are rotated when you take your car in for an oil change, however, make sure to read your vehicle’s owner manual to see what is suggested. Contact us if you have any questions about tires and cars. Schedule an appointment with the Oak Motors Service Center to get your tires checked out! For over 30 years, Oak Motors has been proudly providing the Anderson, Muncie, Indianapolis and Central Indiana region with high quality vehicles, unmatched service, and informed, friendly associates that simplify your car buying experience.